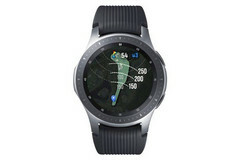 When compared to the regular Galaxy Watch, the new Samsung Galaxy Watch Golf Edition comes with the Smart Caddie app that has a database with information about no less than 60,000 golf courses worldwide. This limited edition wearable succeeds last year's Gear S3 Golf Edition and, for now, it can only be found in South Korea. Last year, Samsung launched a special edition of the Gear S3 smartwatch aimed at golfers. Its main highlight was the software companion Smart Caddie, a piece of code that includes a database with information on over 60,000 golf courses across the globe. Now, the Galaxy Watch Golf Edition is official and targets the same category of consumers. The aforementioned mobile app that makes the Samsung Galaxy Watch Golf Edition and its predecessor a bit special has been developed in collaboration with Golfzon Deca and allows its users to track their shots and score. Even more, it also provides information on the height of the terrain. Those who would like to use it on other devices will be disappointed to find out that Smart Caddie is exclusively available on Samsung's smart wearables. Sadly, this limited edition Galaxy Watch is only available in South Korea for now. Those interested can get the 46 mm model for the equivalent of US$367, while the 42 mm model is a bit cheaper, carrying a price tag that reads US$351. This smart wearable has no launch dates set for other markets yet, but it will probably reach the US just in time for the Christmas shopping season.